WordPress frameworks have existed for years but unfortunately the terminology and therefore the basic understanding of what they are, why someone should use one and who should be using them has often been lacking. I want to change that with this post. I have been planning this guide for quite some time — ever since my post Why I Switched to a WordPress Theme Framework kicked off such a rich and nuanced discussion on the topic here on the ManageWP Blog in fact. If you get a chance please check it out and give the comments a read — it’s a perfect primer for this article. The request that popped up over and over again was for a post outlining the current state of WordPress Frameworks. Something that defines precisely what they are, which ones are recommended for who and how they differ from each other. That is exactly what you’ll find in this post. So let’s get into it! Almost every WordPress theme is a Parent Theme. Unless it is specified as a Child Theme (or a Framework) then it is a standalone Parent Theme. Parent Themes should contain the theme design, functionality and templates required for it to run on WordPress. A Child Theme inherits all of its functionality from its Parent Theme but makes it possible for a user to make further customizations without affecting the future “updatability” of their Parent Theme. If you’re wondering if you should have a Child Theme running on your WordPress website then the answer is yes. Always create (or make sure you’ve been provided with) a Child Theme if you’re planning on making any custom changes. Otherwise you will probably be in for a nasty surprise when your next update comes around. For more info on how to do this check out this post by our Editor Tom Ewer: How to Create a Child Theme in WordPress. How are frameworks different from a Parent Theme or Child Theme? According to the definitions provided above I hope there is no confusion as to where Child Themes fit in and what their purpose is. From my experience it’s when attempting to split the difference between the second definition of a WordPress Framework and that of a traditional standalone Parent Theme that things start to get a little confusing. In this instance the important word to latch on to is template at the end of the second definition of a WordPress framework. A Parent Theme template is not meant to be used as a theme all by itself. It’s almost there, and therefore makes a great starting point for further development, but is meant to be used (and often requires the use of) an additional Child Theme. Genesis is a great example. The Genesis Framework is available by itself but StudioPress is adamant that you (the designer/developer/end user) should either always create a Child Theme to use with it or use one of the many Child Themes they provide. Why use a framework like that at all? 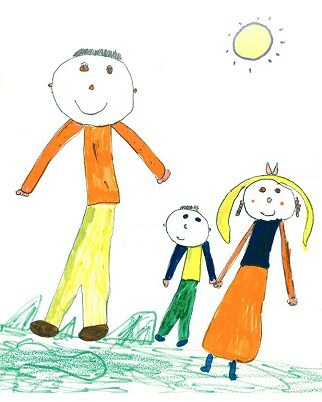 Why not just use a great Parent Theme and then create a Child Theme for it? The answer is that a properly coded framework (like Genesis) is going to be much more feature-rich than a standalone Parent Theme. It will almost entirely separate functionality from design, packing all of its extensive functionality into the framework (and additional plugins) and depend almost entirely on a Child Theme for its design. With a standalone Parent Theme you get your (more limited) functionality, design and templates all in one. This results in a theme that is perfectly ok to use, but not nearly as flexible when it comes to advanced functionality and design customizations. Who are WordPress Theme Frameworks for? This is an interesting question that has a few different answers depending on where you’re coming from. For the most part though frameworks are for web developers/designers who want a faster way to produce more powerful and feature-rich websites for their clients with little to no custom development. StudioPress, the creators of the Genesis framework, have a great car analogy they use which I’ve borrowed before when explaining this topic. WordPress is like the engine; A framework is the body and internal features/functions; and then the Child Theme is your site’s paint job and exterior design elements. It’s a succinct description that helps put things into focus. If all a developer has to do is “put on a different coat of paint” (instead of building everything from the ground up for every new client) then they’re able to take on a lot more work and make a lot more money. So of course this is a great tool for developers. Beyond developers though frameworks are great for web designers, publishers, bloggers and any other type of end user who wants a powerful yet “future-proof” WordPress website without extensive development (that they may or may not know how to do). In fact I would say that many of the more popular premium WordPress frameworks have become less about providing developers with a lean core of functionality and more about empowering “do-it-your-selfers” in the WordPress community at large. A trend I think will be obvious as you read about the premium frameworks below. Now whether or not you think that is a good or bad thing is a topic to be discussed in the comments. My goal with this post was not to begin a massive debate about whose framework of choice is better than someone else’s. While that might be fun I think the most beneficial way to approach this post is to start with the following assertion: every single framework featured in this post is worth taking a look at. From an objective point of view there are no bad frameworks here. They’re all good. Most of them have found their own loyal (and in some cases fanatical) followings as a result. The question is: which one is right for you? And only you can decided that after reading about and comparing your options. High overall value, i.e. be a good investment. This of course is dependent on how well a framework meets the needs of its target market (developers, DIY or both). Great customer support and a large/active community. The ability to strike a good balance between serving the needs of both customer groups mentioned above without becoming a “diluted product” in the process. Or, be a perfect fit for one or the other. I should also note at this point that this post contains absolutely zero affiliate links. So you can rest assured that I’m not giving any one framework a “boost” in the hopes that I’ll generate extra income. 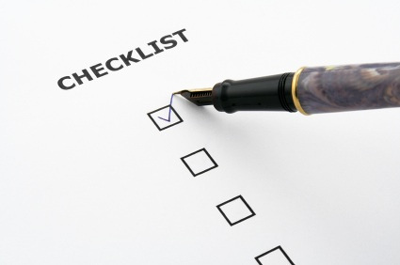 The following recommendations are made with the best interest of this readership in mind. Please note that I have listed these frameworks in alphabetical order. They are not ranked best to worst or anything like that. The specifics of the framework is what will determine if it is a good fit for you, not my subjective opinion. Catalyst is premium WordPress framework that’s positioned itself nicely within the WordPress community to serve business owners, WordPress DIY enthusiasts and intermediate to advanced developers particularly well. When you make a purchase it comes with the Catalyst Framework, their Dynamik Child theme (complete with 800+ design options), unlimited licenses for personal or client websites, a framework that’s optimized for SEO/Social/Multisite, a very active member’s only forum, theme updates and support for life, in-depth documentation and more. While it does not come with what they call custom skins, you can purchase them separately from the Dynamik Skin Store if you’d rather not start from scratch on your own skin or Child Theme. Or spend time customizing the Dynamik Child Theme. Which, I should add, is pretty fun and easy to do with all of the options they provide. 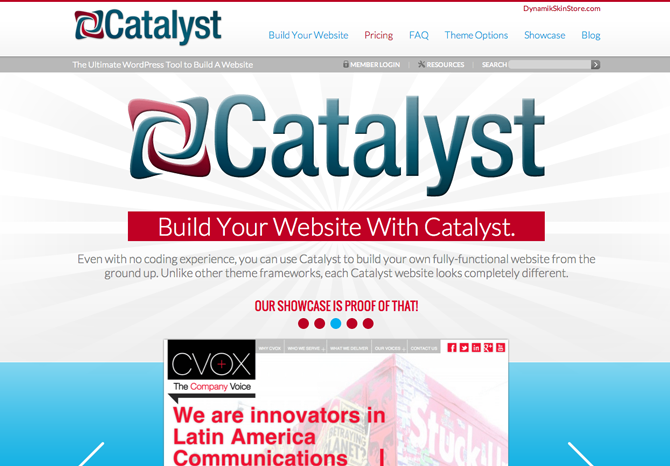 Arguably Catalyst’s biggest strengths are its one-time fee, unlimited website licensing, lifetime support and updates, fanatical fan/user base who appear to be very active in the forums (and elsewhere I researched Catalyst online), and its extremely useful front-end custom CSS builder. I would say the only real downside to Catalyst is that the control panel and general admin navigation is not quite as polished as say WooThemes or PageLines who market themselves to everyone from beginners to advanced users. Recommended for: Intermediate to advanced web developers are going to love Catalyst. It’s going to give them a flexible and powerful framework to create websites for themselves and their clients. They’ll have a lot of help from support and the catalyst forums, as well as solid documentation and tutorial videos. 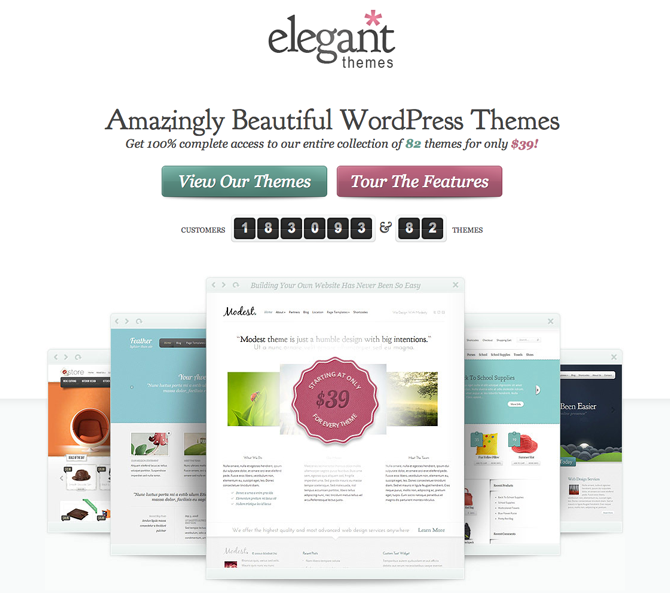 Elegant Themes is widely known in the WordPress community as “the best value for your buck”. They have a stellar library of 75+ pre-made themes that run on the Elegant Themes framework, a growing arsenal of powerful plugins and one of the best support teams available for WordPress — all for $39 a year. Unlike most of the other frameworks on this list though, Elegant Themes does not give users access to just their framework, so going in there’s no question that members will be using one of their themes — instead of a custom built Parent or Child Theme they create themselves. But that’s not necessarily a bad thing. Instead it’s a great way to provide potential clients with ready to go options that they can demo. Not to mention you can also switch between the available themes as much as you want. The options panel is fairly straightforward, easy to understand, and nearly identical from theme to theme. Which means once you’re familiar with the backend on one you can more easily switch between them all. The plugins you have access to as a member are not just usable on your Elegant Theme but on any WordPress theme. Meaning that just having the membership for the plugins might be a good idea for some. The downsides are obvious though: this is not a blank slate with endless options for customization. The idea is to pick the Elegant Theme that best suits your needs and then tweak it rather than create something original. Recommended for: Anyone creating a self-hosted WordPress website for the first time and/or beginner WordPress developers and web designers looking to make WordPress Websites an offered service without getting in over their head. Genesis is by far the most talked about and commonly recommended WordPress framework on this list. Chances are you have heard about it even if you’ve never looked into frameworks before in the past. That’s because it is by far the best purchase at the intersection of value and power/flexibility. At just ~$60 you get what many call the industry standard of WordPress frameworks, unlimited website licenses, unlimited updates and support for life. The Genesis framework by itself is very lean and fast with a focus on SEO, speed, security, site “future-proofing” and flexible design options. It is always meant to be paired with a Child Theme, whether that be one of the many StudioPress offers or one you create yourself. The StudioPress approach is geared more towards the intermediate to advanced developer and curious DIY users can certainly become “dangerous” with it in short order. Total beginners can use it but they will either want to take a StudioPress Child Theme as is or look for another more beginner friendly framework. I would highly recommend the Prose theme for beginners as it’s got the most point and click control over the theme’s design elements allowing those users who’d rather not get into a lot of code avoid it. For the most part. Almost all of the StudioPress Child Themes are aimed at creating great blogs that are tight on security, optimized for SEO and great at converting visitors into email signups. 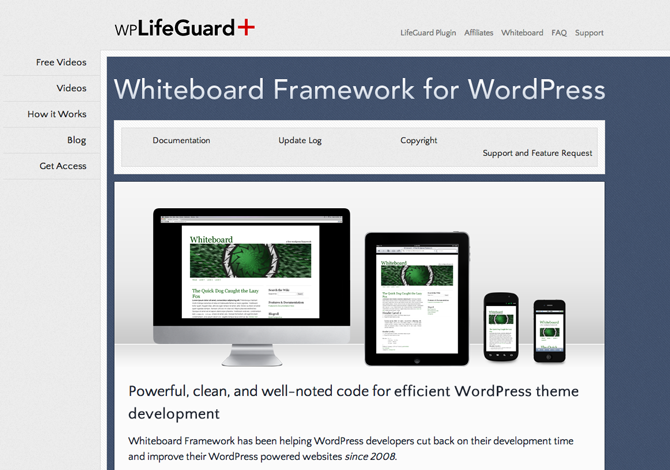 So it’s no wonder this theme framework has been such a darling in the WordPress blogging community. Recommended for: Intermediate to advanced developers who want a tried and tested framework to build out new and exciting Child Themes or quickly turnout new websites/themes for their clients. The only framework on this list that provides such a massive amount of unlimited features/support for such a low one-time fee. And the community aspect of this purchase is enormous; one of if not the largest customer/fan base. For designers and non-coders everywhere Headway is a really exciting Framework option. It’s an entirely drag and drop theme builder that gives you insane control over every single element of the entire theme including individual pages, posts, post types, taxonomies and archives. The Headway Framework uses the Headway Grid to allow their customers to create any layout they can dream of in a dynamic drag and drop visual editor. Once the layouts are complete the next part of the visual editor is all about filling in the design elements section by section — again, with total control. You can even build landing/squeeze pages, unlimited navigation blocks and unlimited widgetized areas/sidebars. All things that are very handy when working on custom design solutions for either clients or personal projects. Everything built on Headway is automatically responsive and easily viewable on both desktop and mobile devices. They also stay up to date on the latest coding standards for HTML5 and CSS3. And while obviously made for non-coders, Headway is not a total shutout for developers, who of course can use all of the features mentioned above just fine too. In addition though they can build their own Child Themes, use hooks for actions and filters, take advantage of the Blocks and Panel API’s as well as sell their own Headway products as third party developers in the Headway Extend store. Speaking of the Headway Extend store, this is where Headway and various third party developers offer what are called “Blocks,” which are basically turn-key solutions built specifically for the Headway framework. Some of the more popular ones include bulk packages of useful features, compatibility with WooCommerce, custom post type template building and a lot more. So what, if any, are the downsides? Well, as you can probably imagine it’s just about the opposite of lean. That’s not to say that you can’t make it fast with the right hosting, caching, and Content Delivery Network (CDN)…but it’s not going to be anywhere near as quick as some of the lighter weight solutions here. Besides that, developers who love keeping things minimal and coding everything themselves may or may not want to deal with a lot of features and capabilities they will never use. I should also mention that when you get into the visual editor, it takes a good deal of getting used to before you’re pumping out new designs. So in a sense you’re not just investing money but probably more than the average amount of time required to familiarize yourself with Headway’s capabilities and unique tools. Recommended for: The Headway framework is perfect for web designers who understand how websites work but don’t want to spend any time coding (without sacrificing any control over various site elements). They want a library of turn-key solutions that allow them to quickly create powerful yet totally custom websites for themselves or their clients. Builder is another impressively powerful no-coding required framework for beginners and advanced developers alike. Although, as I’ve mentioned before, actual advanced developers might find all of the built in customization options and turn-key plugin solutions a bit bulky. But that doesn’t mean it isn’t a great product. And if we’re being fair, which I like to think I am, iThemes does a great job of separating out its “bulk” by placing the vast majority of the design — or as they call it styling — options into the Style Manager plugin. So what you’re getting is the Builder Core Theme, a varying number of Child Themes depending on which package you purchase, a powerful style management plugin and a year of support and updates before you have to re-up. 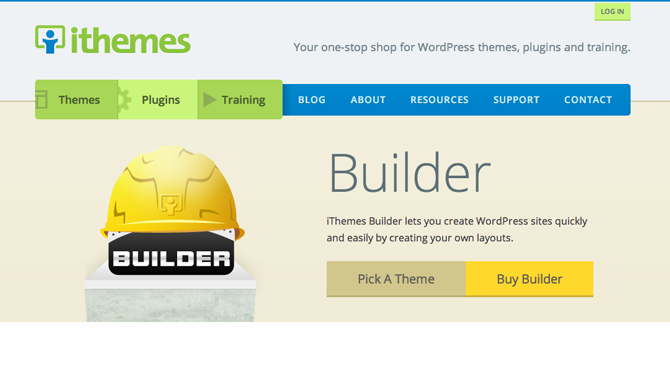 While that may not sound like a whole lot, it is only after you dive into the details of what you’re getting (and what else is available on the iThemes website) that Builder really begins to look like a top notch WordPress framework option. First, lets talk about Builder itself. It’s a responsive framework that comes with five foundation Child Themes and a very flexible layout editor. This layout editor allows you to very quickly (I’m talking a minute or two tops) create various page layouts by mixing and matching the available “modules” or page parts in your preferred order. Then of course there is the Style Manager plugin that allows you to manage the various design elements associated with the Builder framework itself or whatever Child Theme you happen to be using. And speaking of Child Themes, depending on which package you purchase, you could have access to 80 of them! That’s quite the strong library of ready to go themes! On top of all that you also get access to something called Builder Blocks. These are feature and design packs that help you create specific types of niche sites. Right now they only have blocks for Restaurants and Event sites but more are on the way. After all that there’s the support, documentation and free tutorials available. If iThemes Builder is not the best documented framework on this list with the largest library of tutorials and extra resources, it’s certainly in the top few. Recommended for: Literally anyone at any skill level (so long as they are at least familiar with WordPress) can use Builder to create an awesome website. 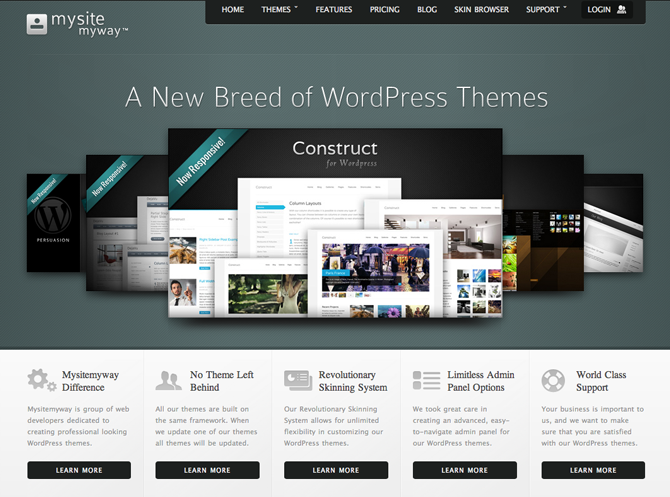 MySiteMyWay is another solid offering by a company who uses their own framework to produce a growing number of themes with a seemingly unlimited number of skins available. This is made possible in large part by their massive (but still relatively easy to navigate and use) admin panel options. You’re even able to export and share your personal design settings as a way of adding to the community’s skin library! It is one of the most social/community driven features I’ve come across while creating this post. As is the case with some of the other frameworks on this list (like Elegant Themes) you cannot get your hands on the MySiteMyWay framework to create your own themes, but if you can find or make what you’re looking for from their themes and skins libraries then you’ll be in good hands. Each pricing option comes with free updates and unlimited support, layered photoshop files, and a 30-day money back guarantee. Also, since their pricing options are just one time fees it looks to be one of the best values represented in the roundup. Recommended for: Anyone looking for ready to use themes, a community crazy about design customizations and theme skinning options and who doesn’t want to deal with much (if any) code. They also have a massive amount of shortcodes so the options throughout the site become near limitless when you start tweaking things with them. After its launch PageLines rapidly became one of the most popular WordPress framework options on the market. Its combination of power, flexibility, and drag & drop functionality has captured quite the loyal following. On top of that, their admin user interface seems to be one of the easiest to use and navigate of the drag & drop frameworks on this list. That probably has a lot to do with it’s popularity as it captures the same crowd but makes it easier for new users to get up and running. The pull here for non-coders and DIY customers is obvious. They get an extremely powerful, easy to use framework that empowers them to either create their own great websites or offer services they would otherwise not be able to. For developers though, the attraction is two-fold. Not only could they also benefit from the power and ease of use that PageLines offers other user types but with the PageLines store they can now create PageLines specific tools/plugins and sell them to other PageLines users. And seeing as it’s a framework already targeting a core user group who’s willing to pay for great turn-key solutions I see a lot of potential for extra income for developers here. Value-wise it’s a toss up for me. 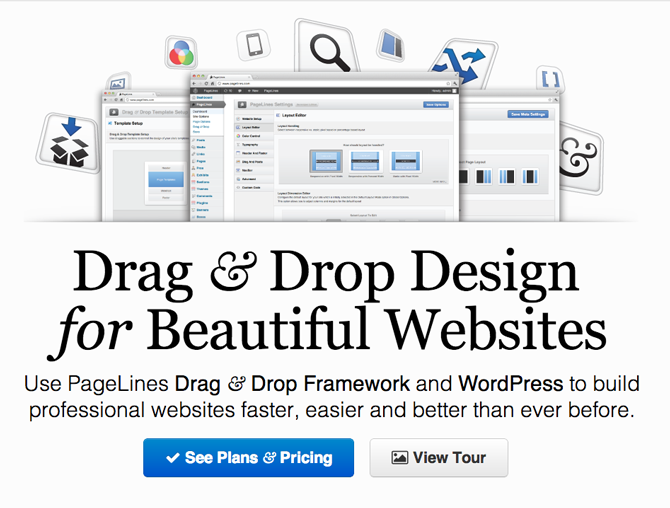 Personally, I think the framework-only prices are fine — especially since they include several themes and premium plugins. However the plus membership packages with a bunch of added support features seems a little steep to me. Not that they don’t offer enough support, they do and it’s amazing, but I just really hate recurring monthly payments and I would almost always rather pay a higher upfront fee to avoid that. But that could just be me. Overall though, PageLines is excellent. My one gripe has nothing to do with their product itself but with those recurring payment options. Which, after all, are just options. I’d say if you’re after a drag & drop design solution you shouldn’t make a purchase until you’ve thoroughly checked out and considered PageLines. Recommended for: Designers/DIY users and Developers looking for a great starting point for creating powerful and varied WordPress websites for themselves or their clients. People who enjoy a lot of high quality turn-key options will love it. The Thesis Framework is one of the most popular, well known and well loved WordPress frameworks on the market. In the past they were a lean framework that had a reputation for being concerned primarily with just one thing: SEO. Now however, ever since their Thesis 2.0 release, they’ve expanded their features quite a bit and are pulling in a lot more non-coders and DIY enthusiasts who not only want a great theme but something they can control completely and tweak with abandon. This new(ish) release focuses on three main features: Boxes, skins and packages. Skins are pre-made designs that you can add on top of Thesis 2.0 in just a few quick clicks. You can also edit them extensively with the new Visual Design Template Editor, which provides very powerful drag and drop functionality to the design process that requires zero coding. Boxes are “like WordPress widgets on steroids” and they continue to build off of the empowering Visual Design Template Editor by allowing you to put widget like functionality (email signup forms, popular posts, etc.) anywhere you want. And not just anywhere, but only there. A change on one page does not have to propagate across your entire site. Which will make for excellent distraction free home pages, custom side bars, etc. Finally, there’s Packages. Where the skins, template editor and boxes help you to get specific functionality where you want it, Packages helps you change how each of those items looks without having to get into any CSS. On top of those three new elements Thesis 2.0 is still a fast SEO-centric framework. It still comes with an enormous community of active users and a helpful support forum. If there’s a downside it’s on the value side and not to do with any features, functionality, design or support. Recommended for: Anyone passionate about SEO and speed as well as someone who craves code-free customizations. There are a lot of people both in the development and DIY communities who really enjoy Thesis 2.0 so in this case it’ll probably come down to personal preference on price/value compared to the other options. The WooThemes WooFramework is possibly the best example of a framework used in-house by a theme marketplace to produce an excellent collection of individual WordPress themes. They’ve also got a top notch collection of premium and free plugins, the two most popular being WooCommerce and the WooThemes specific WooDojo that houses much of the WooFramework’s extensive functionality. Beautiful is the term I would use to describe their theme designs. On both the front end and the back end! Everything they give to their customers is neat, well documented and in general has a sense of “polish” and “togetherness” that goes above and beyond what most of the other frameworks listed here provide. “It just works” is a phrase that comes to mind, and hundreds of thousands of customers agree. 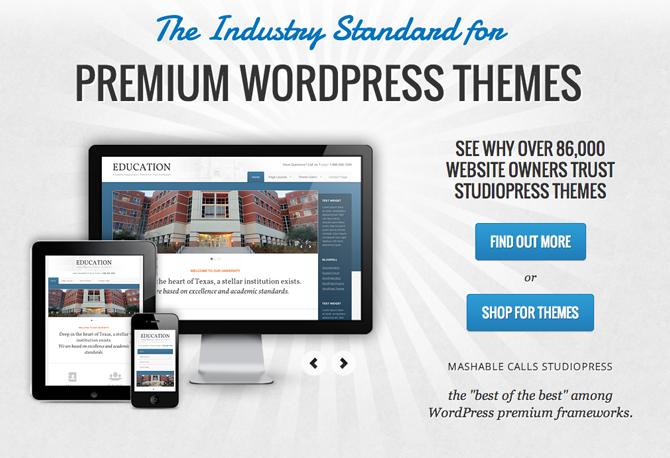 So you’re joining quite the online community when you buy anything from WooThemes. Obviously it’s probably the best framework option for building out a website with an online store. Due to the massive success of their WooCommerce plugin, it’s deeply integrated into all of their themes, but it doesn’t come baked in (which is important). Just like all of the other great features offered by WooDojo, WooCommerce is something that you can activate and add it to your site with just a few clicks, but if you don’t want it then it’s not there contributing to unnecessary bulk. Of course creating online stores is far from all WooThemes cares about. Their themes catalogue contains themes for online apps, businesses, magazines, multimedia, personal blogs/sites, creative portfolios, etc. Their most versatile theme, Canvas, is a brilliant zero coding required option for designers/developers who want a great starting point to create a wide variety of websites. 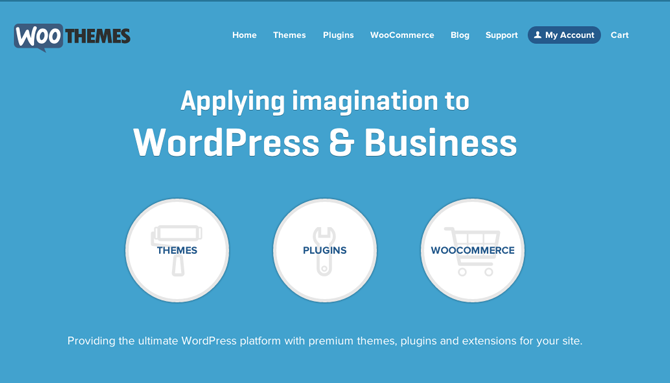 Recommended for: Anyone who enjoys a beautiful theme that “just works” with some of the best and most powerful plugins made for WordPress. Developers/Designers are going to love using Canvas and the average user is definitely going to get their money’s worth when it comes to individual themes used for specific purposes. 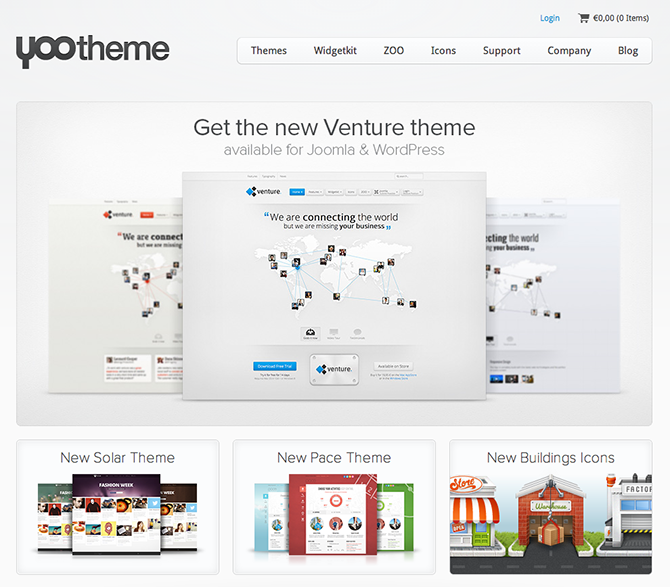 YOOtheme uses a business model similar to WooThemes and Elegant Themes. They use their Warp Framework in-house as a drop in code library to build out an exclusive marketplace of WordPress themes for their members to download and use, which they add to with a new theme each month! But they also provide the Warp Framework for developers to download and build their own themes with which is something the other companies I mentioned do not do. Probably one of my favorite things about them is that they provide multiple design skins for each theme in their marketplace so that the end user has several nice starting points for their customizations; or the option to just swap out the copy and run with a great looking website. YOOtheme also provides comprehensive documentation, premium support, a community driven support system (forum) and other exclusive tools for their members — such as their Widgetkit. This makes for an attractive package for anyone who wants a powerful future-proof site, with clean code, premium support and tools for advanced features. On the downside their subscription model is a bit on the expensive side when compared to others on this list. Mostly because of their Euros pricing and the extremely low site license restrictions that seem designed to push everyone into the Developer Membership. Also, anyone who enjoys an extensive admin panel with a lot of options may not be quite as happy with this framework as they would be with some of the other ones on this list. The admin is far from incomplete or difficult to use, simply minimal. Recommended for: Anyone (Developer or DIY User) who wants to spend as little time as possible on theme design and most of their time on content, features and site layout. Full Details | Price: 39 Euros for Basic Membership; 79 Euros for Standard Membership; and 249 Euros for the Developer Membership. 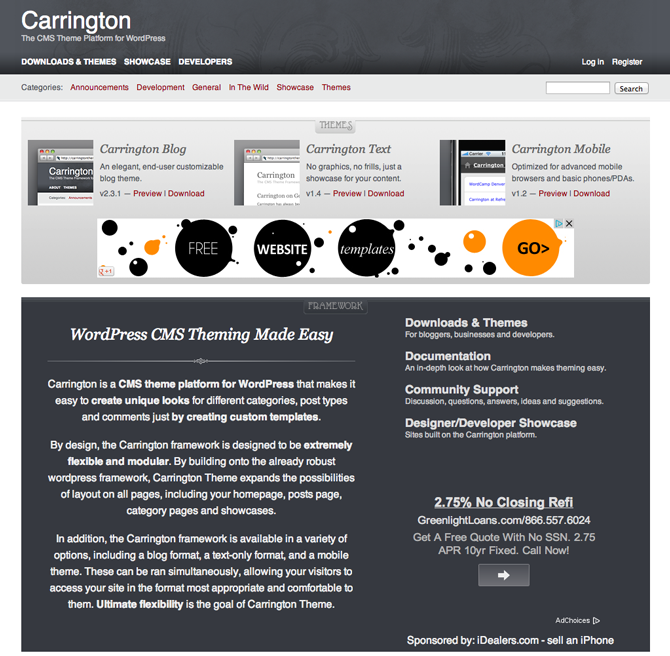 The Carrington WordPress framework by Crowd Favorite is all about flexibility and easy theme styling. To do this the developers focused on providing a solid core so that anyone using Carrington would only need to create custom templates for their various categories, post types and comments. To help get the ball rolling Carrington comes in three different variations: blog format, text-only format and mobile theme. Recommended for: Anyone who buys into the Carrington development philosophy. This framework is probably the most unique out of everything on this list as it does not try to follow certain WordPress conventions in favor of leaning heavily on custom templates and less conditional coding. 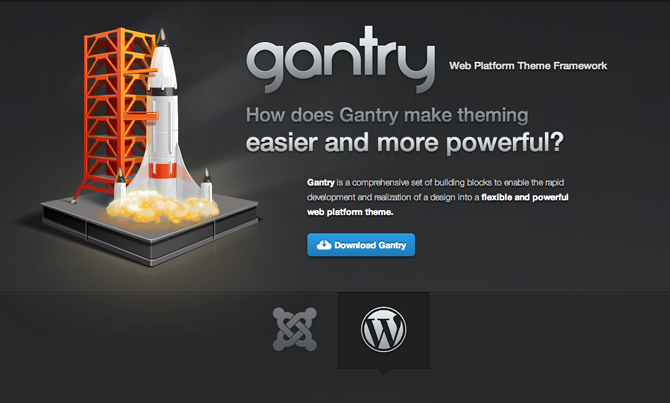 Gantry is a WordPress theme framework created by the folks over at RocketTheme. They developed it to be the basis for all of their Joomla and WordPress projects but have made it available to the rest of us via a General Public License (GPL). Gantry puts the most emphasis on flexibility and a collection of rich features. This is accomplished by creating a new layer on top of the traditional module configuration of WordPress to provide users with an unprecedented level of control and flexibility. Many built-in widgets and gizmos such as font-sizer, Google PrettyPrint, Google Analytics, to-top smooth slider, etc. Recommended for: Intermediate to advanced developers looking to create WordPress websites that are highly extendable. 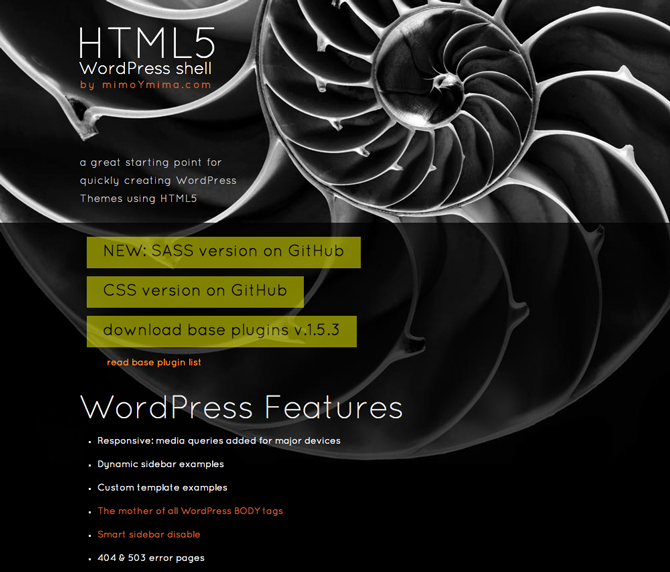 The HTML5 WordPress Shell is a WordPress framework created by Brooklyn-based web design studio mimoYmima. This is the same framework they use when creating their own websites and they hope to improve it by opening it up to the public under a General Public License (GPL). It comes with a “base plugins” package of 15 free plugins that they recommend using to get the most out of every WordPress install. Recommended for: Developers who are crazy about HTML5. 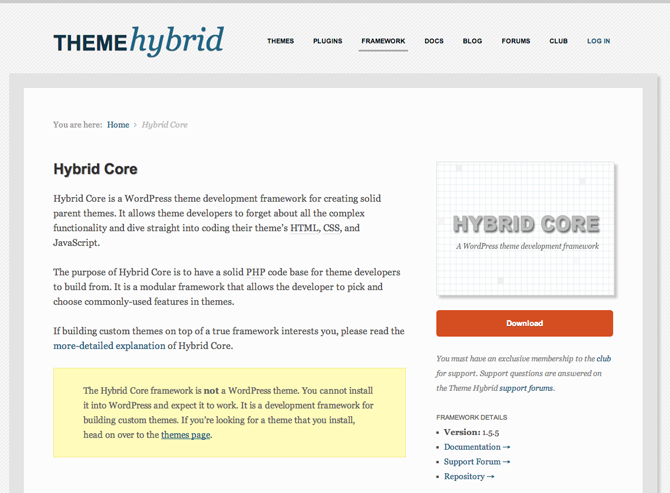 Hybrid is a modular framework with a solid PHP code base that allows developers to pick and choose commonly-used features for their themes. Recommended for: Anyone who enjoys a modular approach to developing WordPress Parent Themes. 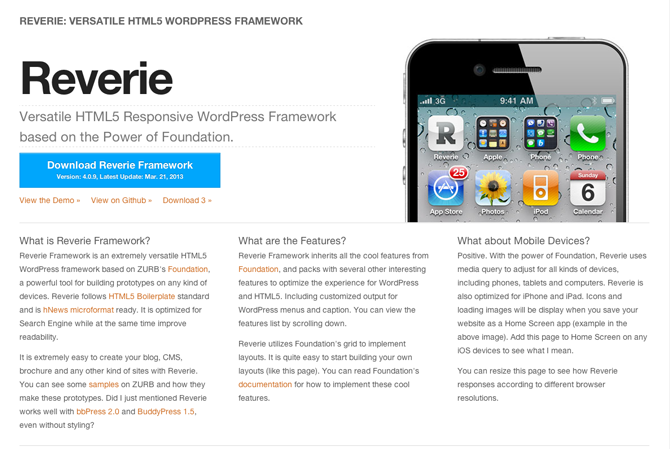 The Reverie Framework by ThemeFortress is a versatile HTML5 responsive framework based on Zurb’s Foundation. Both are available under the MIT License. Clean image HTML output for TinyMCE, only class and alt are returned. Post title will be automatically used for alt. Template structure inspired by Roots. Separated loops from templates, for better WordPress practice. Recommended for: WordPress developers looking for a grid approach to developing mobile first WordPress websites. 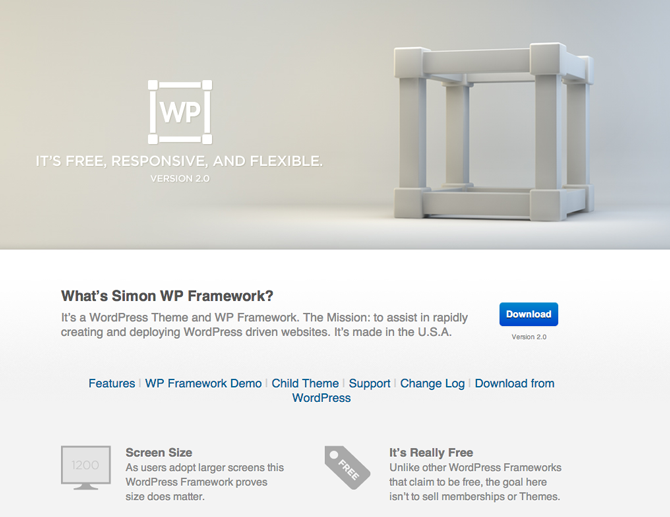 The Simon WP Framework was created by web designer and developer Simon Urbina. His mission is to “deliver common sense web design solutions [with] designs that are beautiful…” And when it comes to his framework he’d like to empower others to do that too. Support is run through a form on the Simon Web Design website and I’m actually unclear how fast responses come. There is no forum. Recommended for: Adventurous and self-relient advanced developers looking for an open source WP Framework that is clean and minimal. The Thematic Theme Framework is an extremely popular free framework created by the Theme Team at Automattic. It has been downloaded over 600,000 times and has a 4.5 out of 5 star rating in the WordPress.org theme repository. So not only is it high quality but the community is huge too. Recommended for: Fans of Automattic, minimal design and large open source community. 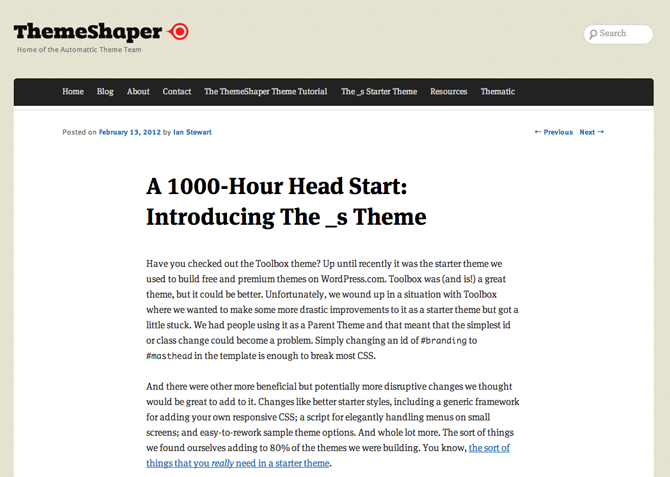 Underscores is by ThemeShaper, aka “The Theme Team” at Automattic. It is is their attempt to give back to the open source community all of the theme developing wisdom they gain creating great products for WordPress.com. This also means that as they continue to build themes for the future of WordPress, that added developer time and knowledge will also find its way into this starter theme. Sample theme options in /inc/theme-options/ that can can be activated by uncommenting one line in functions.php. Some small tweaks in /inc/tweaks.php that can improve your theming experience. They can be activated by uncommenting one line in functions.php. Keyboard navigation for image attachment templates. The script can be found in js/keyboard-navigation.js and is enqueued from the image attachment template, image.php. A script at js/small-menu.js that makes your menu a toggled dropdown for small screens (like your phone) ready for CSS artistry. It’s enqueued in functions.php. The GPL license in license.txt. Recommended for: Developers who want to do things the Automattic way. 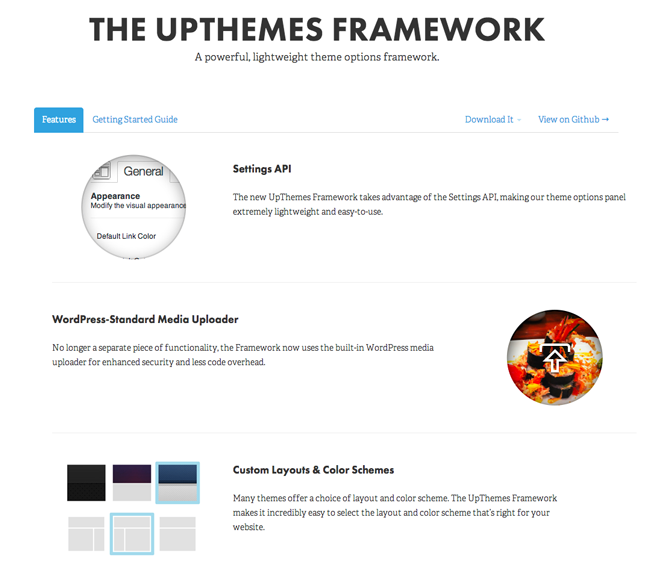 The UpThemes Framework takes a free approach to the same business model some of the premium theme marketplaces utilize above. While they do run a premium WordPress themes marketplace they offer their framework up under a GPL for any developer who wants to use it. Access to the support forums is free but there is no premium or dedicated support option. As a bonus though they do provide a nice Getting Started Guide. Recommended for: Developers looking to add the features above to an existing theme they’ve created. The Whiteboard WordPress framework has been around since 2008, which (I think), makes it the oldest framework on this list. Definitely the oldest free WordPress framework on this list. But that of course does not mean that it isn’t regularly updated. Recommended for: Advanced developers who enjoy working with the Less Framework to create responsive WordPress sites for any device. After reading this post you should know the following things: What a WordPress framework is, how it fits into the WordPress ecosphere and what exactly you’re looking for in a framework that’s a good fit for you. I tried to do my best to provide quality options without being too biased. Hopefully I succeeded! Let me know how I did and what you thought about the various WordPress framework options in the comments below! Great article. Thanks for gathering this for us! I find the Gantry Framework to be bloated, and difficult for the RocketTheme folks to support well. There are too many unanswered support threads on their forum. It appears they are dragging a good amount of legacy, unneeded code into WordPress from their Joomla offerings. 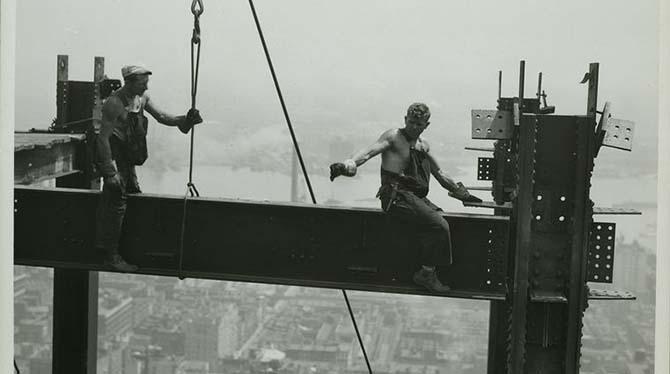 Websites created in Gantry run slower (significantly) and use much more resources creating the page to be rendered. I am an advance (just to clear that I am not noob) user who can code if needed (by learning, it’s been long I use to code HTML a little) but would prefer no-coding to start a blog/site. Later I can always customize slowly. It’s been a long for this web site thing and coding so I have started researching about it. What I want to do is to put a site and blog in it which I can customize easily, like moving text boxes/media around. I am going to use DreamHost (already purchased) to host the site, wondering if they will support what ever we are talking here (I mean different FrameWorks/Themes) which I am yet to buy. I have seen them mentioning about WordPress/DreamPress in the control panel but didn’t discovered much. I am glad that came across to this article and now I have a place to clear my doubts about WordPress. Somehow I am obsessed with Genesis due to the value (price) and the way they talk about support commitment, security(framework) on their site and explain all about framework. Their site is simple but informative and attractive enough to obsess anyone. I am trying to decide something between premium themes over free to reduce maintenance hassle (if at all there is any) and get good support. What kept me thinking is, how customizable are they? If I buy the Genesis FrameWork, will I be able to port a theme from some other provider and use it on DreamHost? Each time I read through this article (well done by the way) I’m surprised that the metric for learning curve isn’t highlights much more. Newbies tend to have visions of sugar plumbs when they hear about frames, especially drag and drop. But it just ain’t so! Simply, there is nothing available that will make WordPress plug-n-play. In fact, until ManageWP came along, even managing a site or two was a pain (thanks). No doubt everyone has their favorites, so I’ll stick my two cents in for others’ consumption. In the premium class, I’ve been toying (toiling) with Headway now. Seems to have the most robust features but yes, heave on the learning with a GUI that’s not so easy on the eyes. Of course, I believe the best of class is Ultimatum, though I’m not convinced they’ll be around for the long term so I’m reticent to recommend them. Time will tell but I’d keep an eye open. Also surprised that Suffusion isn’t mentioned in the free class. Its not classified as a frame in the repository, but I think by definition it fits and it is so feature rich that it out-frames some of the premium frames. Hi, I am a beginner in WP Theme development field. Can you suggest me what framework should I use for start build my own theme? I’ve become a diehard WOO fan over the past few years and I’m currently working on trying to make WOO Canvas the only theme I use. Even if I client says, “I’d like to use Theme ABC,” I ask, “What do you like about it? What features? What design?” It’s usually not too hard to then build it in Canvas (or any framework, of course). The best tool is the one you know how to use, right? Thanks so much for the detailed write up. I’ve been using PAGELINES and I’m quite disapointed with it because it takes a lot of times to get used to it, it’s too complex for simple task. I think there is a lot of people trying to develop simple website but it’s often made for too complicate CMS. I’ve been trying BUILDER it’s look like interesting I love the way that you could make your own design page layout, that’s an awesome feature to have. I think I will choose this one for next development. Catalyst is interesting but design is too poor. I love to have something with a bit of design inside. I’ve been trying canvas and forget it for pagelines (but it was interesting). I would love making design from 0 using stuf like BONES, but it’s a lot of work. And as I’m not very good for PHP it’s quite hard for newbies like me. I only know CSS and HTML. I’m looking for something easily customisable. I want to have google typo. without knowing necessary PHP ajax… I only know CSS and HTML. I want something with some design inside but not necessary if it’s easily customisable. I hope BUILDER could do all of this. Thanks for sharing your knowledge. I was a Thesis user from mid-2009 up until around March of 2013. Most of that time, of course, I was using Thesis 1… which I gained some popularity with. I was (and still am… though pretty inactive) a beta tester for Thesis 2. I still build client sites with Thesis 2 at this point but only if a client specifically requests it. 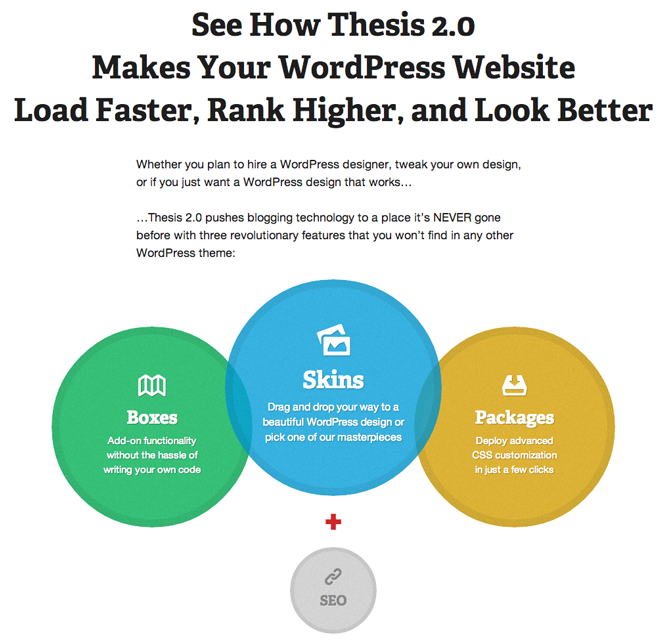 Thesis is great and easily the most powerful WP theme builder around. But the learning curve is too steep for some and putting clients on it ends up being a babysitting job that I don’t want. Before coming to that conclusion, I did a little rabble-rousing to get the Thesis community to embrace Thesis 2 in my article about why people really didn’t know how to use it. It’s still motivating people to take action to this day… but I’ve moved on for the most part. In march, I launched my own WP framework called Volatyl… distributed through Volatyl Themes. I built Volatyl’s options based on the repeated requests from clients when I freelanced with Thesis as well as the most common tasks I faced when building my own custom sites. I did two things differently than a lot of frameworks out there. I left design up to designers. Volatyl does its job as a framework by taking control of HTML structure. It’s fast. It’s written in HTML5. It’s fully responsive (including responsive drop down menus). It supports multiple layout configurations. It also supports unique sidebars per Post/Page. 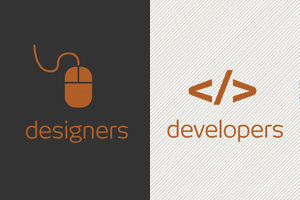 So all designers have to do is create a child theme and get busy with CSS. I left SEO options out because I simply don’t think they belong in a theme. Instead, I made sure Volatyl was compatible with popular SEO plugins like Yoast’s SEO plugin. I don’t want people losing SEO options just because they switched themes. I created Volatyl specifically for designers, developers, and budding developers. It’s packed with custom hooks and filters for complete customization with custom PHP. But at the same time, the options are so easy to use that someone who’s ready to learn how all of this stuff works is in the perfect place to start learning through the Volatyl options without writing much PHP. Anyway, there are a ton of great frameworks out there. They all help facilitate the theme building process in their own way. I tried to keep Volatyl straight to the point but powerful and flexible. Take a look when you get a chance. Again, great round-up. This is probably the most comprehensive I’ve seen on the net and I’ve been in the framework arena for a good minute. Although WP Frameworks are intended to facilitate the process of creation of WP Themes (for developers), it is also providing the end-user the possibility to manage and set up a theme without advanced knowledge of programming. Tesla Framework from http://teslathemes.com/ is a real example. Regards! Thx for this article. You should really check out the Gavern Framework for WordPress at http://www.gavick.com. Responsive layout, wpml ready, almost woocommerce ready, lots of widget positions and an excellent sollution for controlling widget appearence. I know I am late on this, but we added paid ZenDesk support. Any and all questions are added as a ticket for review by my staff. 2. Some type of rating would be helpful, especially for newcomers like me who came here looking for information to help decide on what framework to start with. Other than that, thank you for coming up with this list. Kudos! Excellent article. I would love to hear your thoughts on the newly released Kriesi’s Avia “Framework”. It seems to blur the boundaries between “Parent”, “Child”, and “Framework”. What I mean specifically is, it provides a great foundation for layout and functionality (Framework / Parent Theme) but also allows you to import “dummy” content to have what is essentially, the same site as you see on the demo. For me, this was a crucial step in not only differentiating from the crowd, but also providing for an easy jumping off point. There are certainly bugs, but it was only just released this month. I’m very interested to see where Kriesi takes it in future releases. Seems to have loads of potential. Well I haven’t heard of this framework before reading your comment so I’m afraid I’ll have to get back to you with any specific feedback. Thanks for sharing! I am a little astounded by your conclusion that Headway is bulky and slow. Chris Lema’s real-world performance testing concluded exactly the opposite. Care to take a look? That said, I believe it’s Headway’s built-in caching sure helps it perform that way. Thank you for the added information! I’m really surprised that neither the HTML5 Boilerplate, nor the HTML5 Reset frameworks made the cut. Or WP-Foundation? These are each really solid frameworks that have helped me with rapid development of custom themes. Thoughts on why they didn’t make the cut? You’re absolutely correct – those are quality frameworks that could have easily made my list. The answer to why they’re NOT on the list is that I just had to draw a line at 10 each (free and premium) and I was personally more familiar with the frameworks included above. If you’ve got some good reasons for promoting those particular frameworks please feel free to respond to this comment with them and link it up! I’m sure other readers will appreciate your insight and the added framework options. No worries, this is an excellent guide. I was curious whether you were familiar with them or not. What I personally love about each of them is that (in contrast to something like Genesis) they really feel like WordPress. The file structure is identical, you don’t have to learn a whole new way of working in order to understand these frameworks. Plus, they are extremely cross-browser friendly, and highly optimized with custom htaccess files. Thanks again for a great summary! Sounds Good! It’s a great collection of WordPress Theme FrameWorks, but This information will help to create for WordPress website owners. I just made a comment at the StudioPress Forum asking for Genesis Experts to make courses or Webinars to make the Framework more strong for sure i could buy a stuff like that! Thanks Andre! I know what you mean about more tutorials at StudioPress. However, I think for their price point the overall value they deliver is already amazing. More tutorials would great, but I feel like I’ve already received more than my money’s worth. Not to mention the forums over there are extremely helpful! I ran into a snag yesterday and it was resolved by a fellow Genesis user by the end of the day. – Underscores does not encourage child theme development. It expects to be a parent theme, the only theme. As a developer, Underscores is my go-to WordPress theme. But, for designers, non-developers, and those who aren’t that familiar with developing for WordPress, you should probably avoid it. – Thesis used to be my go-to starter framework, but I really think that Thesis 2.0 was a nightmare. It broke more sites than it improved and introduced an insanely confusing administration system that they boasted was for non-developers, but the system didn’t make sense to anybody. On top of that, there was zero documentation on launch, the UI and drag and drop interface just did not work, and everything was confusing. It ostracized long time Thesis developers who had gotten used to Thesis Hooks, and did something so bizarre that I don’t think that Thesis will recover from it. Thesis 1.9 is still a great framework for quasae developers, the group who has enough experience working with WordPress to want more from it as a Developer, but might not have a really extensive background in PHP or the WP Core. 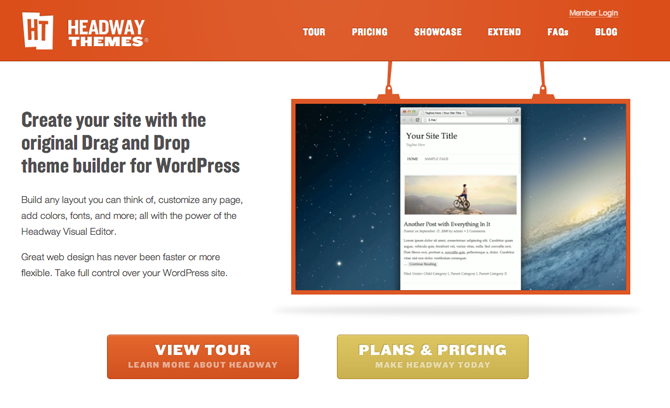 Headway is great for the first-time WordPress new developer, the developer who wants to have a custom design but doesn’t really know how WordPress theming works behind the scenes. The limit to headway, IMO, is for Designers, because getting a really precise design out of Headway — or any of the other drag and drop frameworks — can be difficult. My darling is Underscores, though. If you’re a developer who builds wordpress sites for clients, Underscores is the way to go. While it gives you a “1,000 head start,” you might be surprised to find a completely blank site when you install it. That’s basically the point. The framework is there, and it’s up to you to develop it. Thank you for the added insights! Really good overview, and since your audience is predominantly theme developers or theme benders, it’s readily understandable. I personally have settled into using Headway and Hybrid, and I’ve used many of the ones you listed. However, for newbies, who I believe remain the overwhelming bulk of WordPress users, these frames are a source of frustration and a waste of money. It doesn’t help that they can easily manipulate the CSS or readily adjust the modules, if they don’t have a clue what either represents. So great article for sure, but you might add the disclaimer – “nothing in WordPress is plug-n-play”. I think I understand where you’re coming from, but I disagree that frameworks are a source of frustration and a waste of money for beginners. I think the evidence is in the overall trend of the premium frameworks who are making themselves more user friendly and even educational. As you said, there is a huge number of WordPress users out there who have no clue about HTML, CSS or PHP. But that doesn’t mean they don’t want to learn. And it certainly doesn’t mean that their website needs are as limited as their knowledge of coding. I’ve found that the frameworks with the best documentation, tutorials and UX designs tend to attract a lot of happy customers who fall into the category of “beginner”. And they’re happy because with the right tools and tutorials to fill in the gaps in their knowledge they feel empowered on the web in a way they weren’t before. In fact I’ve been that customer in many ways. When I purchased Genesis and Canvas by WooThemes I didn’t have a very good grasp on CSS. Since making those purchases though I’ve come a really long way and could now do all of my own CSS if I needed to (with the help of stack overflow when I get stuck). And it’s made me want to learn more too! I’ve got PHP on deck for later this year or the start of 2014. So I guess what I’m saying is that although frameworks were not intended to be a method of encouraging WordPress users to become more educated, I think it’s a definite side effect. And as such I would never discourage someone who’s a beginner for at least checking them out and giving it a go. We usually support within 3 hours using Zendesk to troubleshoot Framework issues. Maybe we could make that more clear with some kind of zendesk integration? Thanks for the mention! Good feedback. Yeah I would definitely encourage you to put more support related info on your website. As I made my considerations for this post and as I read the posts/comments/forums put together by others on the topic support was always a really big deal. It doesn’t have to be extensive in all cases, but from a user’s perspective there’s a certain peace of mind you get from knowing exactly what you’re signing up for. Obviously not a super serious question, it just caught my attention. Our policy currently was driven more by American clients requiring US born code. In our case, we have outsourced experience that would make your jaw drop in terms of malware and stolen code. I love outside code when it’s done by great designers. To be sure there are a ton. We don’t want to go there at this and want code in house. I would also add from a personal perspective if certain countries are overly political or overtly threatening the country I live in, I won’t send business there. Just my view of self preservation, but that is policy. We handle millions upon millions of clicks and any downtime for any reason is a non-starter. Thanks we will add a more robust way for our users to ask questions and like you said have peace of mind. I think Bones is my best framework. It is highly commented, and has very clean code. Also it comes with SASS and LESS or you can use the old standard css if you don’t know preprocessors. @Jjojo, That’s just a stupid comment. Frameworks are for designers/developers who need to get a project up and running in the quickest time possible. I did look at Bones and considered including it here. It’s not that I thought it was a poor choice, just that I had to keep it to 10 in each group. Thanks for bringing it to everyone else’s attention! From the Bones website: “Bones is not a Framework”. Love these roundup posts. nice work. There are a few I hadn’t heard of. I’ve been using thesis for most of my stuff from scratch. The box model makes it easy to create custom code that doesn’t necessarily fit into a functionality plugin, nor need to be inside its own functions file. It’s also a great way to include it with a theme. Thanks for the read and taking the time to comments! Great post, Nathan… we use Thematic and Genesis for our clients at Webdirexion, but I learned about some interesting frameworks (free and premium) that we had not yet considered via this post. Glad to hear it! Thanks for reading Scott! I have used Thematic for a few website clients so far, and I purchased Genesis a while ago, but have only used it once (very minimally). I was wondering how you go about choosing which of the 2 Frameworks to use on a given project? I was also curious as to whether you’ve tried to make Thematic responsive in any of your projects? Do you have many resources for the Thematic framework that you use? I have tried to find a really robust and up to date “codex” for Thematic with no luck … or perhaps an active community forum or documentation? Nathan, please chime in if you have any opinions one way or another on this issue. Great post to keep as a reference! 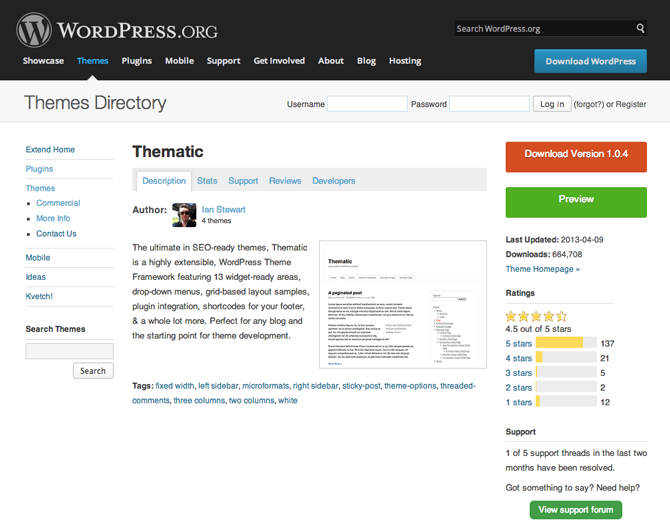 I gotta bookmark it as I need to choose a good WordPress theme before migrating from blogger. Please do! And good luck with the transition.